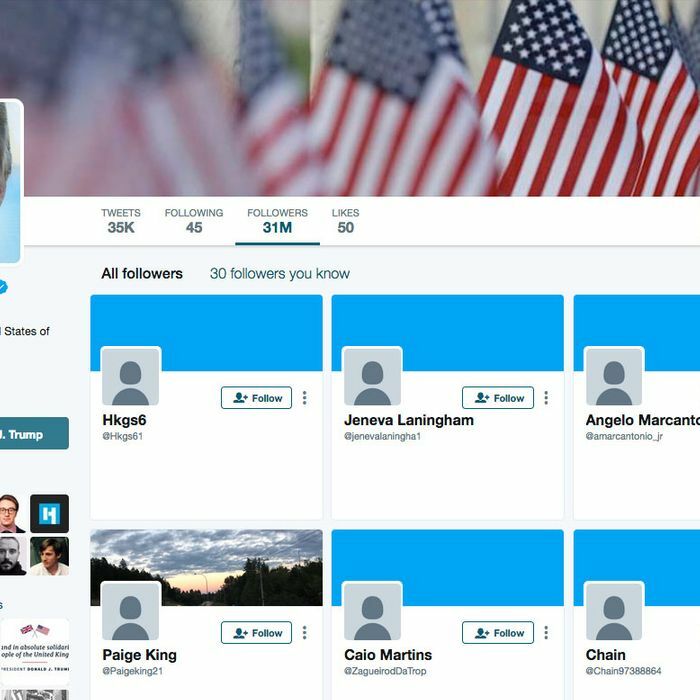 What’s Up With All Those Trump Twitter Bots? What’s Up With All Those Trump Twitter Bots? Probably Nothing. As conspiracy fever grips the nation — and American citizens struggle to answer questions like, “What was the orb?” “Is the pee tape real?” And, “What was that red light blinking at the White House over the weekend?” — a new mystery has emerged: Over the weekend, Donald Trump, the worst Twitter user of all time, and also the president, gained more than 5 million followers. Even for Trump, that is a lot. What does it all mean? What is he planning? The #resistance — the cohort of Twitter users all racing to be the first smug reply to any of Trump’s tweets — is keeping a close eye on the situation. @realDonaldTrump << account has gained over 5 million followers in less than 3 days. Mostly bots. He's getting ready for something. Flynn’s subpoena deadline. Trump’s lawyer subpoenaed. Kushner caught w/ mounting evidence. Need more reason for Trumps new twitter bot army? Is this a pro-Putin conspiracy to sow disinformation on Twitter and use a legion of bots to make it appear, anecdotally, as if President Trump has a popular mandate in support of all of his terrible policies? I mean, I guess, but it’s highly unlikely. Here’s the thing about Twitter bots: Anyone can buy them for anyone, for relatively cheap. Just because the bots swarmed to Trump doesn’t mean they came from him or his team. Creating a Twitter account doesn’t even require a verified email address, making it easy to generate new, imaginary users. Plus, there are dozens of much more likely, and much more mundane, reasons to set up a bunch of bots besides “declaring cyberwarfare on the American people.” Maybe you run a business that sells inflated follower counts, so you create a bunch of bots and direct them to follow your paying customers. Maybe you’re a spammer who wants to DM links to people or hijack hashtags. A good reason to think that this is just a run-of-the-mill scammer? A survey of numerous new Trump followers shows that many are also following celebrities like Kim Kardashian, Ellen DeGeneres, Barack Obama, Jimmy Fallon, and LeBron James, and brands like ESPN and CNN — the same types of popular accounts that are regularly suggested to all new users during Twitter’s initial onboarding process. Having bots follow these accounts allows them to appear, to the untrained eye, just like new users who maybe haven’t gotten around to uploading a profile picture. That millions of fake accounts would glom onto the most controversial person on the planet, and subsequently on the social network, right now is hardly surprising. No one this side of Louise Mensch thinks that Russia is attempting to collude with ESPN. Sure, maybe all of those other celeb follows are just a cover for some insidious Twitter psyop in which Donald Trump … uh … gets a lot of likes and retweets? Unfortunately, “great engagement” is not a solid legal defense during impeachment proceedings.